Dendrobium is a diverse genus of orchids with different cultural needs. Some go through a growth phase and a rest phase during the course of one year, and must be given water and temperatures to match these growth and rest periods. General culture is as follows, but is suggested that you refer to the care tag instructions that accompanied your dendrobium orchid. Light requirements are very bright with some sun. Ideal location is near a east or south facing window with protection from the hot noon day sun. Temperature needs do vary greatly with different varieties. Most dendrobiums do well under intermediate conditions, 55F to 85F. The cool growing varieties require a defined resst period with temperatures as low as 50F with a dry dormancy period. Always refer to the care tag that came with your plant. 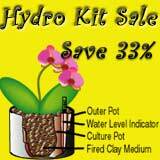 Growing you orchid in a hydroculture planter takes all the guess work out of watering. Water when there is no water left in the outside pot. Pour the nutrient solution slowly into the clay pebbles next to the water level indicator. Water until the indicator reads about half way between the "min" and "opt" level. Always be sure there is no water in the outside pot before watering again. About once a month, rinse the foliage and the clay pebbles under warm running water to remove any dust and accumulated plant food from the medium. It is best to do this in the morning on a good drying day. Return the culture pot to the outer pot and water again with the nutrient solution. The ideal time to do this is when the orchid is in need of water. You can even let it sit dry for a day or two before watering. This gives the root zone optimum oxygen. If your dendrobium is a cool growing variety that requires a cool dry dormancy period; leach it once a month with cool water during this dormancy time and return it to the outer pot with no water. When new growth begins to appear resume the normal watering pattern.